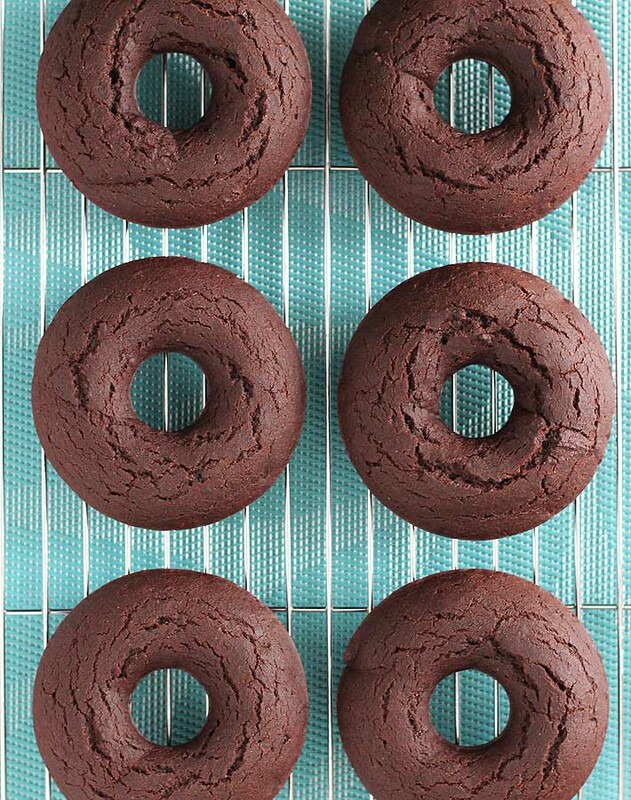 Vegan Gluten Free Baked Chocolate Doughnuts that are soft, fluffy, and sweet. The crackly sugary glaze makes them extra perfect…so perfect, you’ll want to make them over and over again! The problem was, I didn’t have a doughnut pan to get answers to my questions. See, I’m picky with my bake and cookware. When I shared my easy vegan gluten free waffles recipe with you, I told you about my lack of love for Teflon cook and bakeware. All the doughnut pans out there were coated in Teflon. However, last fall, I found one that I liked. Finally, I’d have answers to my baked doughnut questions! So I got to work on my first recipe, Vegan Gluten Free Baked Chocolate Doughnuts. I had never made doughnuts, baked or fried, so I tested this recipe thoroughly. Four times to be exact! I got the vegan version on the second try and the vegan gluten-free version on the fourth try. So for those of you who are vegan and not gluten free, I’ve got you covered. For those of you who are vegan AND gluten free, I’ve got your back, too. It took me a while to get the vegan gluten free version because I couldn’t figure out the right type of flour to use. On the first try, I used my regular, go-to blend and…nope. The taste was off. On the second try, I went with an oat flour/almond flour blend and that wasn’t quite right either. So on the third try, I tried a new-to-me gluten free flour (details below), one that I had only used a few times and it was a winner. Note that I’m using all-purpose flour in the video that’s included in this post. Both the vegan and the vegan, gluten free versions of this recipe are soft, fluffy, sweet, and the crackly sugary glaze on top makes them extra…YUM. What’s the best doughnut pan to buy? Curious about the answers to my questions from above? What do baked doughnuts taste like? And what is the texture of baked doughnuts like? Baked doughnuts are delicious. They’re like mini, doughnut-shaped cakes. They’re fluffy like cake (these doughnuts are, anyways), and they whip up really fast. Are baked doughnuts like fried doughnuts? No, they’re not quite like fried doughnuts. The fried, non-yeast, counterpart to my vegan gluten free baked chocolate doughnuts are heavier and more dense. Still delicious, but these are a lighter version that are just as delicious. Bake up a batch for Valentine’s Day, a birthday, or any day you feel like having a treat, it doesn’t have to be a special occasion! Share with family, friends, co-workers, classmates…no one will know they’re vegan or vegan and gluten free. I hope you enjoy these amazing, baked chocolate doughnuts. Be sure to pin them on Pinterest and if you make them, share a pic with me by tagging me on Instagram. I’m @delightfuladventures over there and my hashtag is #delightfuladventures. I love seeing your remakes! 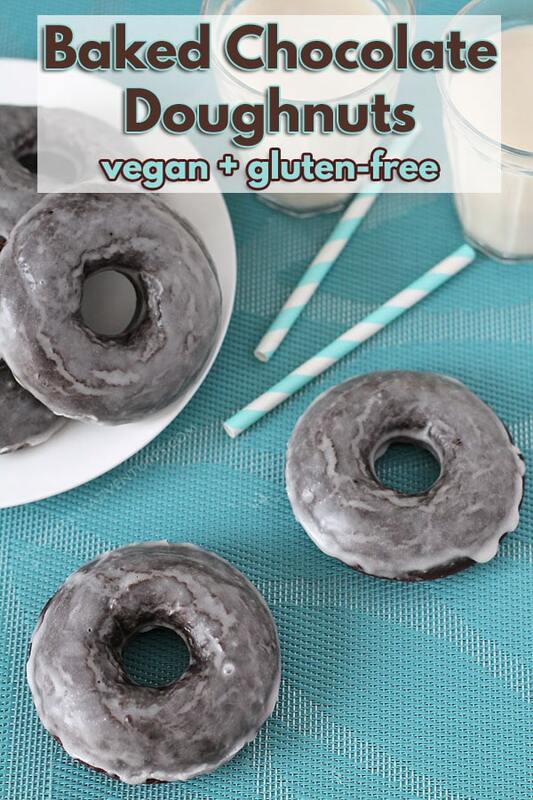 Looking for Vegan Gluten Free Baked Chocolate Doughnuts? Your search has ended. 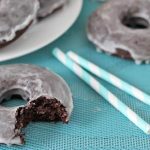 This recipe can be made vegan OR vegan and gluten free and the result is perfectly soft, chocolaty, sweet doughnuts you'll love! In a small bowl, mix the milk, melted coconut oil, vanilla, and flax mixture together. Add the powdered sugar to a small bowl and add the warm milk, and vanilla. Mix until everything has combined into a liquid glaze. When the doughnuts have fully cooled (they don't take long! 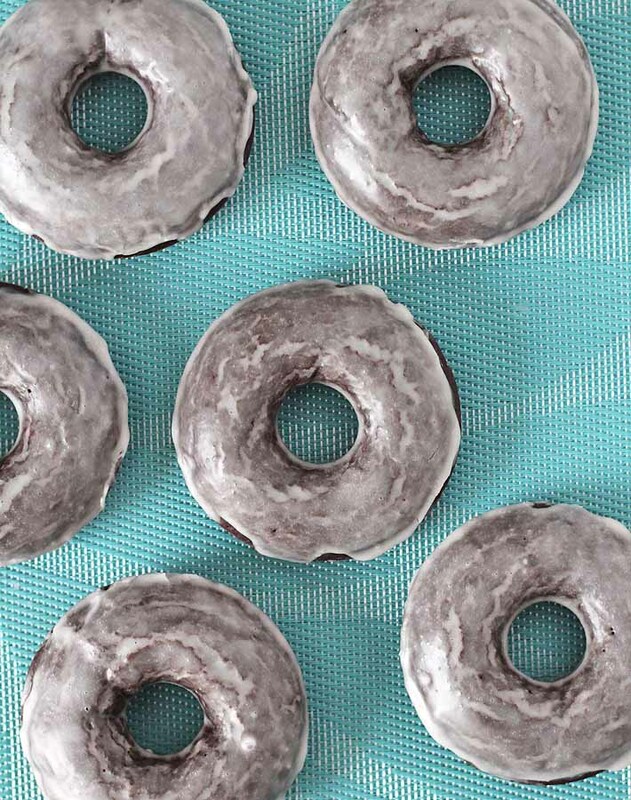 ), dip the tops of each doughnut into the glaze. Repeat with all the doughnuts. Note that I'm using all-purpose flour in the video that's included in this post. If you are making the vegan gluten-free version, it's important to know that every gluten-free flour blend uses different ingredients and ratios. Results will always vary when different flours are used. I tested with several different flours and the only one that worked well for me was the Bob's Red Mill 1 to 1 Baking Flour (the one with the blue label, not the red label) so please know that your results may not be the same as mine if you substitute with a different gluten free flour. 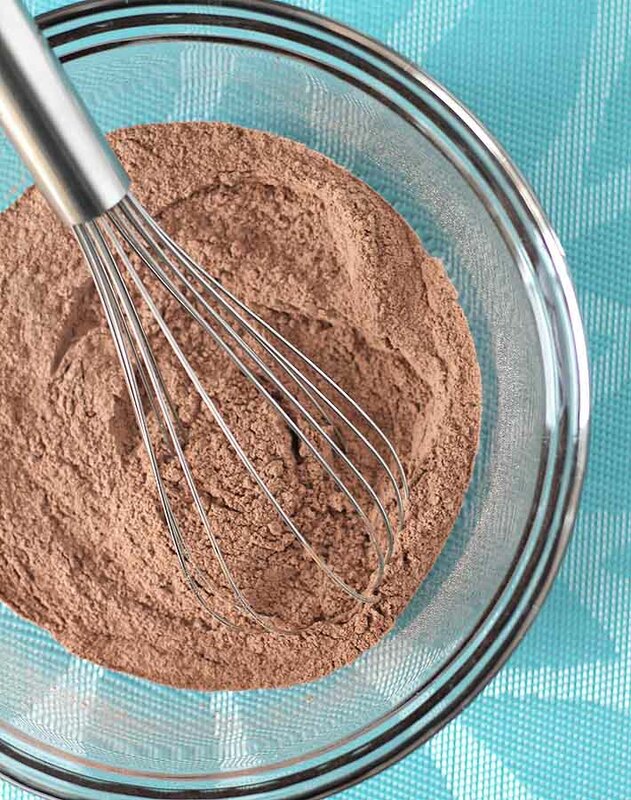 If you are making the vegan gluten-free version, the batter will be very thick. That's OK! Just pipe it into the pan as-is. It's best to eat the doughnuts the same day they were made. The glaze does not hold up well. If you have leftovers, refrigerate them but know that the glaze may melt into the doughnut if kept for too long. Nutrition info listed is for the vegan gluten-free version. Calorie count for 1 doughnut using the vegan only recipe (using all-purpose flour) is approximately 189 calories. Nutrition info is to be used as a rough guide only, learn how nutrition info is calculated on this website. These were delightful! I didn’t have a donut pan so I used a muffin pan – works just fine. I used real egg and Swerve sweetener in place of the coconut sugar. I did use the recommended gf flour. The flavor and texture was fantastic and very satisfying. I’m so glad to hear they worked out well with the doughnut pan and with your substitutions, Valerie! And also very happy to hear that you liked them so much 🙂 Thanks for your note! Is the oil an absolute necessity and if so, is there something I can substitute for it? We are a no oil household. Other than that I desperately want to make these!!!! Oh my these were amazing!! I used cane sugar, an actual egg, and original almond milk. I should have doubled the recipe!!! This will definitely become a regularly made treat! Hi Jen! I’m glad the recipe was a hit! It’s for sure a regular here, too (I just made another batch this past weekend 🙂 ) Thanks for your note! Hey! These look amazing! I was wondering if I could substitute the coconut sugar with anything else? Also, how do you measure the flour? Spoon method or packed method? Thanks! Hi Ashley! You can replace the coconut sugar with brown sugar, and I measure using the spoon and level method. Hope this helps! If you make the recipe, I hope you love it! Let me know how it goes! 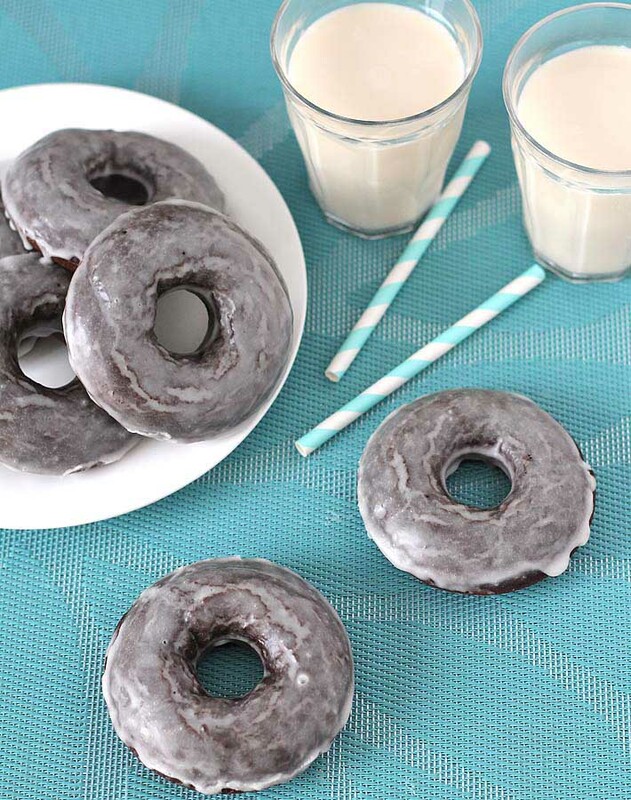 I want to make these for Monday for my kids’ school for national donut day, but we have a nut allergy. Will any oil work in place of the coconut or what should I use? These turned out ok, but my donuts were flat and more like pancakes after cooling….any ideas what went wrong? Hi, I am excited to try this out, can you use regular milk? I love this recipe but I can’t use the Red mill flour mix. The rice flour & potato starch don’t agree with me. What other flour mixes did you try that you mentioned? I saw the comment about the oat & almond flour. Did you try cassava and coconut? Thanks for your help! I’m going to make the regular ones for my kids. Also I just saw that doughnut pan is available also in BB&B and you can use a coupon for it too. Easy to make. I subbed carob. They’ll probably taste good still. I won’t know until breakfast tomorrow. This tastes great! I substituted the flax egg with real egg, and I even tried a bit less sugar. Ran out of cocoa powder, so I put half that and half unsweetened baking chocolate. Just reduced 1 tablespoon of coconut oil for every 1 ounce of baking chocolate. Turned out great! Also would suggest adding some cacao nibs or something in the donuts if you want another texture. Hi Aileen! Yay! I’m so glad you and your son love the recipe! I don’t tend to lean towards recipes that are overly sweet, so that is one of the things I love about these doughnuts. The sweetness is just right 🙂 Thanks so much for your note! 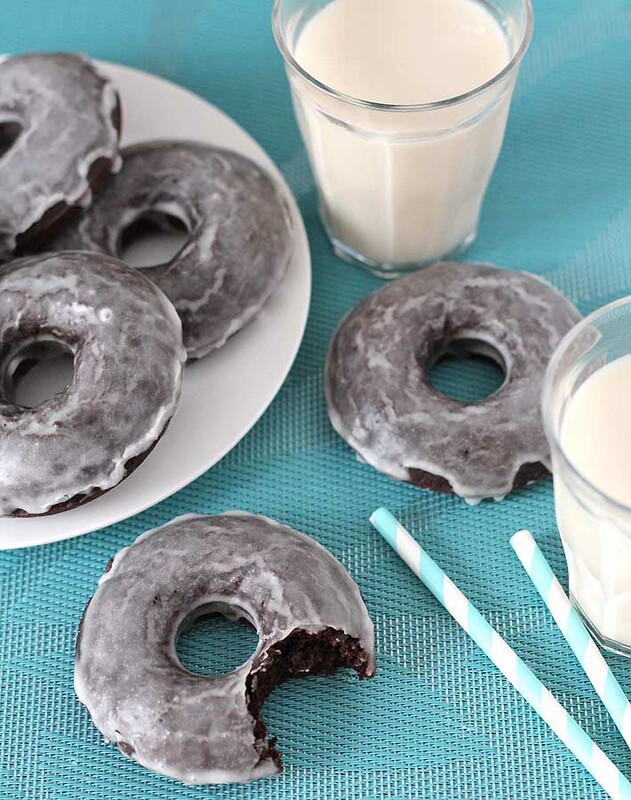 Just whipped up a batch of your vegan chocolate donuts for National Donut Day. They are amazing. Can’t believe how light and fluffy they are. It’s a keeper. It’s the perfect recipe for National Donut Day, isn’t it? I’m so happy to hear you like them, Doug 🙂 Thanks for your note! I made these then made a double batch to freeze, delicious!!!!!!!! !